Shadow theater is not exclusive to Indonesia. Other Asian nations such as Cambodia, Malaysia, Thailand and Laos also have their own styles of shadow play. This performing art originally from India came to Southeast Asia with the spread of Buddhism and Hinduism. The wayang tradition settled into the royal courts of Java and Bali during the twentieth century. In Java, the cities of Yogyakarta, Cirebon and Surakarta gradually became artistic and cultural centers from which the shadow puppet spread to the entire island. The plays narrate the Indian sagas of Ramayana and Mahabharata, the adventures of Panji, a Javanese legendary prince, or depict the exploits of Amir Hamzah. Wayang presentations were used for the transmission of Javanese tales and legends to the audience. 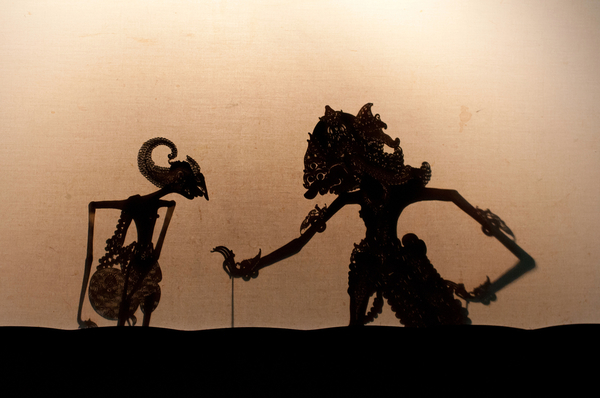 The most common form of shadow theater is the wayang kulit played with flat leather puppets. It is also the Javanese’s favorite form of theater. A wayang performance is usually accompanied by a gamelan orchestra, the Indonesian traditional instruments. The dalang is the artist who manipulates the puppets. He sits on the ground, in front of a white screen with a lamp suspended above. The gamelan orchestra is placed behind the dalang who leads the musicians while singing and narrating the story. The stories and performance techniques were formerly handed down orally within families. Because of his great knowledge, the dalang is highly respected within the Indonesian society. It’s often possible to sit on either side of the screen. In the front, you see the dalang with the colorful puppets and the musicians. On the back, you can admire the incredible effects of the shadows in movement. In 2008, wayang was inscribed by UNESCO on the List of the Intangible Cultural Heritage of Humanity. Wayang theater reflects the excellence of traditional performing arts throughout the Indonesian archipelago. The term wayang applies to many forms of theatrical arts including wayang topeng and wayang orang performed by human dancers. Wayang topeng is a masked-dance while wayang orang is a danced drama. In the course of time, the wayang has evolved into numerous narrative styles. Shadow theater has taken various forms in different regions and the puppets have distinctive features too. For example, wayang golek is made of wood and dressed with traditional clothes. 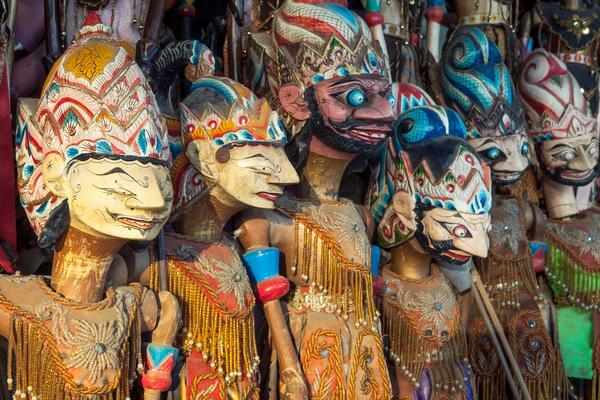 It is the most popular form of wayang in West Java. Making the puppets is an intricate art requiring a lot of time and detailed work. Highly-skilled artisans know how to carve, polish and paint each character following specific criteria. Puppets must be the correct size with the appropriate features to be suitable for the dalang’s use. Wayang kulit is the basic form of traditional Javanese puppet theater. In a wayang wong performance, the dancers reproduce the puppet’s stylized movements. In today’s Indonesia, shadow play teaching and performances are offered by several theater companies. The best known are Sri Wedari in Surakarta and Bharata in Jakarta. The Indonesian government encourages universities to have a traditional theater section to ensure the continuity of this heritage. Wayang performances always fascinate travellers as well as Indonesians. We hope you will have the chance to see one during your journey!